You are here: Home > MCSD News & Alerts > MCSD News & Alerts > CMS News > What’s On Your Plate? ISU Summer Cooking Class! 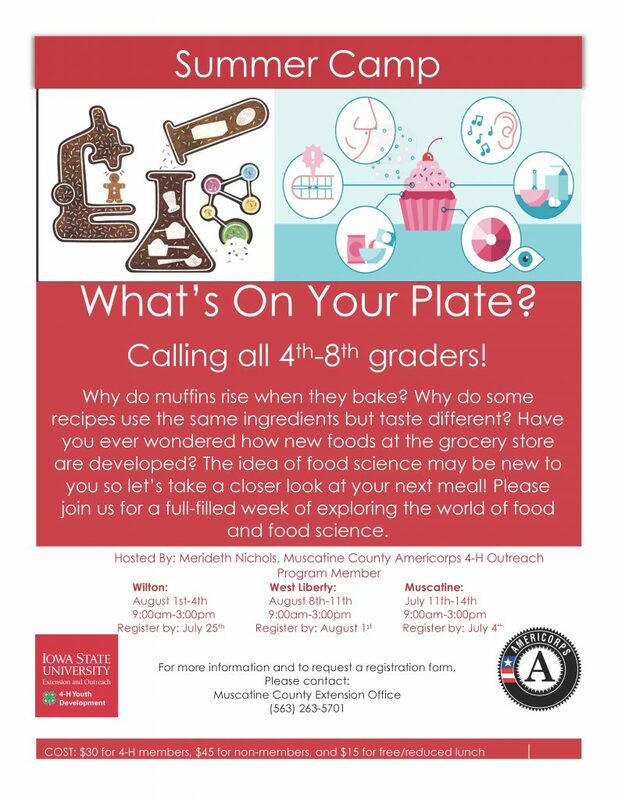 Iowa State University Extension and Outreach Muscatine County presents What’s On My Plate? for 4th – 8th graders. A summer STEM camp all about food science. July 11 – 14, 9 am – 3 pm at the New Hope United Methodist Church. During this workshop, youth will get a chance to take a look at a variety of food issues, as well as learning different techniques for baking and cooking. We will look at gluten products, examine what happens to different food products when cook as well as learning about different ways to use eggs in the kitchen! Register soon, space is limited! Registration due by July 5th. A fee of $30 for 4-H members, $45 for non 4-H members will be charged and a charge of $15 will be charged for students who qualify for free and reduced lunch. Call (563) 263-5701 or at www.extension.iastate.edu/muscatine.